Have you ever kept them? Lol! Instead of the traditional way of doing things, I’d like to encourage you to take a different approach (or at least do this in addition!). And that’s to focus not on your “outcomes”, but rather on what’s INSIDE. Specifically, focusing on your image of yourself. Fact: There are deep seated beliefs that are operating in your mind, often on an unconscious level, that are stopping you from becoming more. Fact: These beliefs, even when uncovered, can seem like the “truth”. For example, if you believe that you ARE a procrastinator, because your history shows evidence of procrastination, you’ll take on that identify and continue to propagate it forward. Fact: If you’re willing to do the work, you can uncover these beliefs, use Tapping to neutralize them, and transform your life. Right now, in just a few seconds, you can discover some of these beliefs. Say out loud (or mentally if you’re reading this in a public area). And fill in the blank with what comes up. I am… lazy? I am… a procrastinator? I am… overweight? I am… depressed? What are the negative thoughts about yourself that pop up when you say “I am…”? These are your BELIEFS about who you are. You can also try this with beliefs about the world. Here’s one that is certain to bring up all sorts of angst and turmoil. Rich people are… Greedy? Snobby? Entitled? Unethical? So now that you have some negative beliefs about yourself, and you have some negative beliefs about a group of people or a state of being (being rich). And here’s why this is SO important. 1. You will always live up to the image you have of yourself. If you filled in the blank with, “I am lazy” – you will live up to it and create that reality in your life. 2. You can’t become something you resent or dislike. If you think rich people are greedy, you will, often subconsciously, do everything possible to remain in poverty, or struggle, or stay away from that possibility of being “rich”. These are the hard truths about beliefs and how they manifest in the world. The good news is that once you uncover them, you can do something about it. One of the reasons Tapping is so powerful in erasing and replacing these limiting beliefs is that we are accessing the body directly (specifically through the part of the brain called the amygdala) to turn off those negative associations that have created these beliefs. The latest research shows that when we tap on these end points of meridians, we send a calming signal to the amygdala. So when we focus on the beliefs, “I am lazy,” while doing the tapping, we are disengaging that mechanism. The deeper, more powerful work comes up when we get specific about WHY we think we’re lazy, how we learned this about ourselves, what experiences we’ve had that have contributed to this way of thinking. Turning off the negative signal and releasing the charge on these experiences can create simply dramatic changes. I hope this short post was helpful in perhaps uncovering a few beliefs you have about the world, and opening up to the possibility that you can change them. To me, that’s the exciting news – that we’re no longer “stuck” with these patterns or old ways of being, and that we can actually DO something about them! 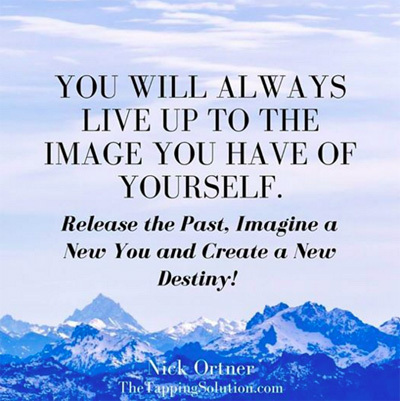 If you want to explore this topic further, and learn how to release limiting beliefs that are keeping you from experiencing the health, wealth, and joy you most desire, I suggest that you start with my NY Times bestselling book, The Tapping Solution. Translated into over thirty languages and selling over 250,000 copies, its transforming lives around the world. Start Tapping Today - Free Gifts! Read the first two chapters of the New York Times bestselling book "The Tapping Solution" and listen to the “Tapping for Stress Relief” CD for FREE! 2. Buy the full book on Amazon, or your local bookstore, or in our online store. If you specifically want to release physical pain from your life or shed some extra pounds (and most importantly, completely change YOUR self-image), you might want to explore our other books, “The Tapping Solution for Pain Relief” or “The Tapping Solution for Weight Loss and Body Confidence”. We also have free webinars to go deeper on those topics! Here are the three topics – pick one right now and commit to finally making the changes you’d like to see in your life stick. It’s time for you to shine at your brightest! And tell me, what did this post bring up for you? What are some limiting beliefs you’re ready to get rid of? Comment below! The statement, “I Am” and the follow-up of why I think that must be the basis of all tapping. So simple, so clear and so profound. Thanks so much Nick for all you do to bring this incredible tool to the masses. I know that tapping works, yet I must constantly remind myself to use this simple tool. I would like to take the webinar. I am 90 years old. Is that too old to get a benefit from it? They strongly reinforced my new strengths I found a few days ago. I love the tapping solution. My problem is that I know about tapping, I believe in it’s healing potential, but I don’t regularly devote the time to actually do it. So, maybe I am a procrastinator? Maybe, also, I’m afraid of change and taking the risk involved when we make a big change in our life. I have been a preschool music teacher for many years and I feel like it is time for me to start the next chapter of my life. I feel that God is telling me it’s time to make a change, but I’m not sure what it is. It is unnerving to think about leaving something you are comfortable in. I want 2016 to be my year to move on to my next life chapter!